Author: Fuentes, Carlos Set In . . . Description: Here is a true literary event–the long-awaited new novel by Carlos Fuentes, one of the world’s great writers. 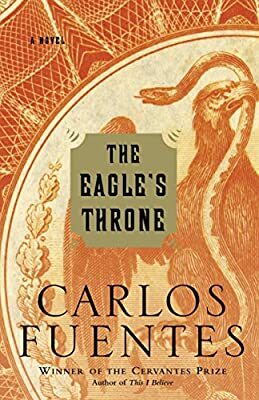 By turns a tragedy and a farce, an acidic black comedy and an indictment of modern politics, The Eagle’s Throne is a seriously entertaining and perceptive story of international intrigue, sexual deception, naked ambition, and treacherous betrayal. In the near future, at a meeting of the United Nations Security Council, Mexico’s idealistic president has dared to vote against the U.S. occupation of Colombia and Washington’s refusal to pay OPEC prices for oil. Retaliation is swift. Concocting a “glitch” in a Florida satellite, America’s president cuts Mexico’s communications systems–no phones, faxes, or e-mails–and plunges the country into an administrative nightmare of colossal proportions. Now, despite the motto that “a Mexican politician never puts anything in writing,” people have no choice but to communicate through letters, which Fuentes crafts with a keen understanding of man’s motives and desires. As the blizzard of activity grows more and more complex, political adversaries come out to prey. The ineffectual president, his scheming cabinet secretary, a thuggish and ruthless police chief, and an unscrupulous, sensual kingmaker are just a few of the fascinating characters maneuvering and jockeying for position to achieve the power they all so desperately crave.